Art museums in our region allow children and adults to take an imaginative journey while learning a thing or two. Read about three art museums in our area and find some of the unique pieces that await. Rockford Art Museum, in Rockford, keeps its galleries rotating with numerous feature exhibits during the year, including the recent showing of young artists’ work, gathered from area schoolchildren. Art museums are a place where children and adults can take an imaginative journey, and they may just learn a few things in the process. Through art, we find enrichment, inspiration and insight into the human condition, and we excite our own creative muses. Luckily, our region holds several art museums that draw a variety of works from near and far. Paintings, sculptures, textiles and decorative artwork are just the beginning of what you’ll find there. The Rockford Art Museum (RAM), 711 N. Main St., Rockford, has spent more than a century enriching the lives of area residents. Thanks to strong community support and some creative programming, the museum is constantly finding new ways to expose its community to contemporary art. The permanent collection includes more than 2,000 modern and contemporary works of art from the 19th century through today. RAM maintains three galleries on two floors, with rotating feature exhibitions that Johnson curates each year. On display now through May 28 is the Laura and John Fraser Collection, a compilation of 122 contemporary paintings, drawings, mixed media works and sculptures created by 57 artists, representing many local and regional works. The couple live in suburban Chicago and have long supported RAM. Once the Frasers’ collection heads back to storage, RAM presents its next Rockford Midwestern Biennial, running June 8 through Sept. 30. The most recent biennial, held in 2016, included 85 pieces of artwork by 78 artists selected from more than 600 submissions. Johnson expects a similar representation this year. In its pursuit of new audiences, RAM has introduced what it calls the Pop-Up Restaurant Series. The periodic event features local chefs who present a four-course meal to patrons as they dine in the company of the museum’s feature exhibition. Rockford’s Abreo and Greenfire restaurants served audiences earlier this season. Alchemy shows off its talents on April 25 and Toni’s of Winnebago appears on May 23. Johnson says the museum will continue looking for new opportunities to engage the public in the arts. 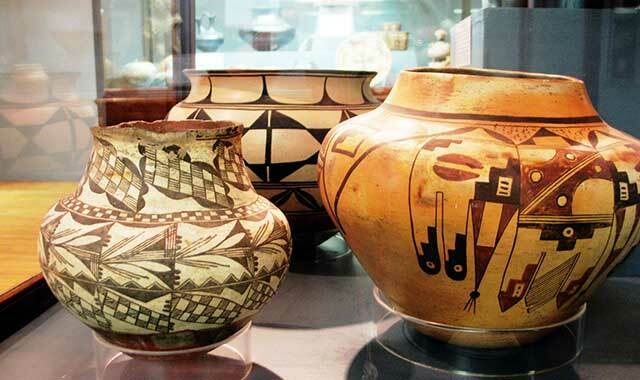 Ancient artifacts from Egypt, Asia and Native America comprise a major part of Freeport Art Museum’s permanent collection in Freeport. 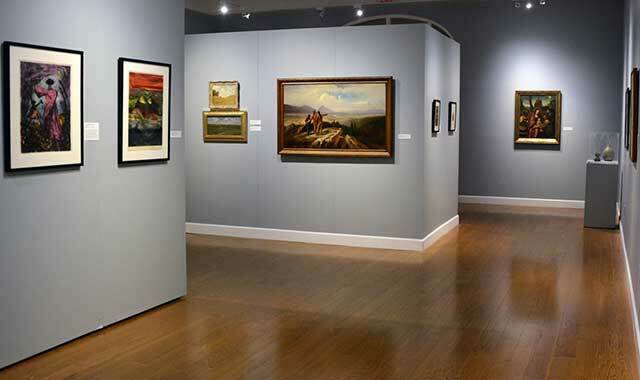 Jessica Modica, executive director of the Freeport Art Museum (FAM), 121 N. Harlem Ave., Freeport, believes patrons can find something new no matter how many times they visit. Created in 1975, the Freeport Art Museum is housed in a converted school building that’s well over a century old. The museum displays art from its large collection alongside that of regional contemporary artists and periodic traveling exhibitions. Shows rotate about every eight to 10 weeks. “We have galleries devoted to our permanent collections, which include European art, artifacts from Ancient Egypt, and art from Asia and Native America,” Modica says. Most recently FAM hosted its annual display celebrating the works of children from several area schools. “We have artwork from students all over the community, and we had 16 schools that are participated this year,” says Modica. Come late April, FAM opens Patterns from Panama, which runs though June 23. It brings out several objects from the museum’s permanent collection, which will sit alongside a variety of molas – a handmade material that forms part of the traditional outfit worn by the Guna (formerly known as the Kuna) indigenous people of Panama and Colombia. It’s a textile usually seen on the front of a woman’s shirt. Outside its exhibits, FAM actively engages area youth in the arts. FAM has partnered with the Boys & Girls Club in Freeport to launch smArt, a program that infuses art into the club’s after-school program. It reaches roughly 400 children each year. 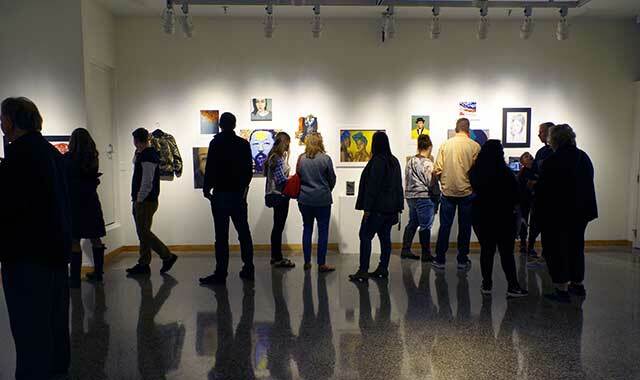 Beloit College students take an active role in the Wright Museum of Art, where they organize shows, manage collections and learn the daily workings of an art museum. The sky is the limit for students at the Wright Museum of Art, situated on the Beloit College campus, 700 College St., Beloit. Learning opportunities are baked into almost every aspect of the museum’s operation. Story says this art museum is unique in the region because of the intensely hands-on experience it affords. The museum has about 6,000 works in its permanent collection, including modernist paintings, 19th century plaster casts, Asian decorative arts and prints spanning several centuries. Through May 20, the Wright hosts “Chipping the Block, Painting the Silk: The Color Prints of Norma Bassett Hall.” The exhibit focuses on works by the late Oregon state native, a watercolorist and oil painter whose greatest love was printmaking, especially from woodblock carvings. “This show will have about 60 prints, including woodblock prints and serigraphs, as well as one of Norma’s carved wood blocks,” Story says. On May 26, the Wright opens the popular 61st Annual Beloit & Vicinity Exhibition, a juried art show that attracts artists from around the region. More than 30 artists participate in the two-month exhibition, considered one of the oldest regional juried art shows in Wisconsin. The winner of the Juror’s Award receives a special display of their work, in a separate gallery, the following year. Story is a big believer in the power art has to teach and inspire, and she’s eager to share her passion for good art with not only her students but the community at large. This entry was posted on Tuesday, April 3rd, 2018 at 12:00 pm	and is filed under Arts & Entertainment, Top Posts. You can follow any responses to this entry through the RSS 2.0 feed. Both comments and pings are currently closed.